From the very beginning, the University of Michigan was envisioned as an institution whose sole purpose was serving the public. Over the last two centuries, we have relentlessly pursued our cherished public mission – through research, education and activities that advance the good of society. Today, public impact and service remain at the core of our mission. As one of the best public research universities in the world, we are uniquely positioned to advance research that addresses major societal issues, and we collaborate with communities in sustained partnerships that work to improve our collective futures together. 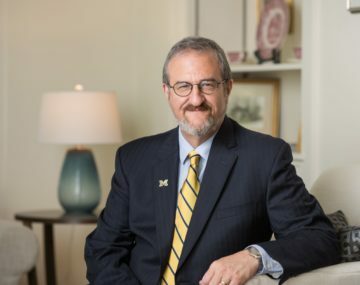 The University of Michigan commitment to engagement spans all three of our campuses, Michigan Medicine, all of our academic departments and student organizations. We also collaborate extensively among disciplines, seeking to leverage our breadth for optimal impact. The commitment is part of our DNA and held closely as one of our deepest values. Ninety-six percent of our students have an engaged learning experience during their time here, as they learn in real-world settings and collaborate with professionals here in Michigan and around the globe. Our faculty seek out research partnerships that enhance our impact as a university and inspire positive change in communities from Detroit to Addis Ababa. Our Engaged Michigan website highlights some of the great work we do in service of society and of learning. We look forward to further strengthening our engagement as we prepare our graduates to address contemporary societal problems and support our faculty’s cutting-edge interdisciplinary research. I believe that our future success as a university will in part be determined by our ability to engage in ever-more meaningful work with all communities we serve.